Color slides from the Giglio festival which happens every July in Williamsburg, Brooklyn. It is the patron saint festival of St. Paulinus from Nola, Italy. 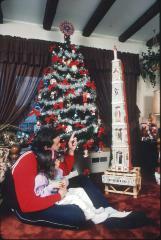 This folder includes images of people with their miniature Giglio towers next to their Christmas trees from 1986 and 1989.